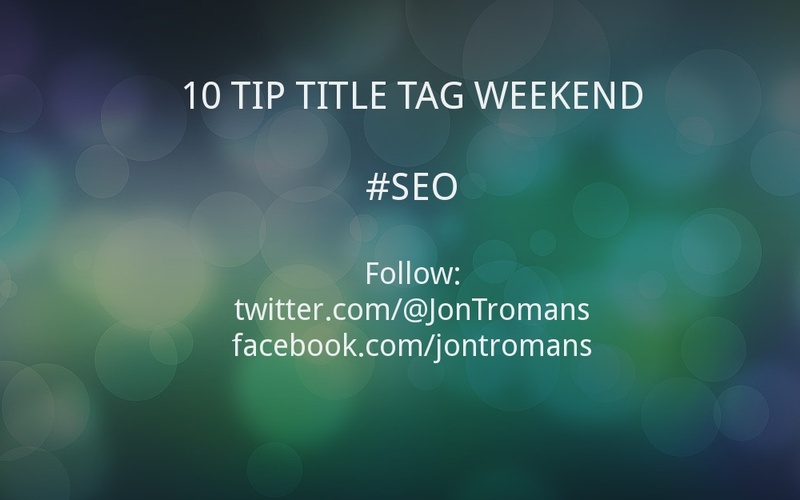 The 10 Tip Title Tag Weekend has just finished on my Twitter and Facebook accounts and thanks if you watched out for them. If you didn’t manage to catch them here’s a recap on all 10 tips to help you write a better title tag. Title tags are the text shared on social media so make them exciting and click-able. Use a key phrase in your title tag but don’t go mad with keywords. Make your title tag a proper sentence and write for your visitors. Make it interesting. Use power words in your title tag. New, Fresh, Improved are great to include but go easy…not too many. Make sure your title tag is within the <head></head> code on your site. Write a different title tag for every page on your website. Make sure your title tag is ABSOLUTELY SPECIFIC to the page… no waffle! Don’t always use your brand name in the title tag. Only where necessary. I hope all these tips were useful, the title tag is something that I focus a lot on during my SEO Training. Feel free to leave your tips in the comments below and watch out for another tips weekend coming soon.